Corten House is an urban house located near the largest park in the city of Sao Paulo, Brazil. The site, long and narrow, contains the program of the house and, its residents, not only have a small external deck with a fireplace on the ground floor, but they also make use of the rooftop and, especially, the park itself for leisure. The facade of the house is made of Corten weathering steel. 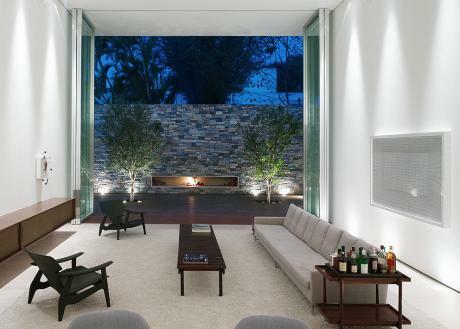 The dialogue between the rusty texture on the outside and the stone, wood, white mortar and the glass build the space. The front door of the garage is made of vertical wooden strips and opens entirely onto the street. The main entry door to the house is also made of wood and, despite being of a color similar to metallic plates, the texture and the presence of the material itself, distinguishes the suspended steel box of the frontal facade. The back facade is composed of a glass curtain that confers transparency to the opaque steel box and a suspended volume which contains movable wooden brises. The interior walls of the lot are made of stone. The interior plan for the ground floor is simple: an ample room with a ceiling height of 5.2m and four folding doors that completely open out to the deck and external fireplace, dissolving the limits between interior and exterior; in the living room, a free wooden volume houses the kitchen and utilities program; between this volume and the entrance door there is a staircase that leads to the mezzanine. The mezzanine, on the wooden volume, is a singular area for the home-theater. From here there is another staircase leading up to the third floor, to the private program of the house, the three bedrooms. The master bedroom, in the back, has a wooden panel of brises to filter the light and can remain completely open. On the rooftop of the house, there is a wooden deck protected by glass guard-rails. This space functions as a solar with a heated pool and a view of the city of Sao Paulo.